Key players: The departure of Ronaldo has left a huge void at Old Trafford and Red Devils manager Alex Ferguson will expect a big season from Dimitar Berbatov after an inauspicious start at the club. Ferguson’s decision to sign Owen raised a few eyebrows but the striker will have a point to prove after a disappointing period with Newcastle. And with places in England’s World Cup squad up for grabs Owen could be set to answer the critics who have deemed him a spent force. Chelsea defender John Terry resisted the lure of Manchester City’s millions to remain at Stamford Bridge and he will again be integral to the Londoners’ hopes of mounting a serious challenge. Liverpool’s chances of finishing one better than last season’s runners-up spot will rest with the Steven Gerrard-Fernando Torres axis. The pair only started 12 times together in the league last season and manager Rafael Benitez will hope they stay injury free this time round. Mark Hughes will hope that new signing Carlos Tevez can help Manchester City get off to a good start. Key clubs: All eyes will be on Manchester City after they bolstered their squad with several proven Premier League players and manager Mark Hughes will be under pressure to deliver results from the first game. It promises to be an intriguing campaign at the Emirates Stadium following the departure of some high-profile players. While all the attention will be on who replaces them the stage is set for British youngsters Aaron Ramsey, Jack Wilshere and Kieran Gibbs to lead Arsenal’s challenge. Manchester United are favorites with the bookmakers to retain the title but how they cope following the departure of Ronaldo will be key to their fortunes, and the margins between the defending champions and Liverpool and Chelsea could be even slimmer. Birmingham, Wolves and Burnley have all been tipped for the drop but Stoke and Hull City both survived last season following promotion. All five clubs, and a Portsmouth side who have lost a number of key players, are set to be among the strugglers this time round. 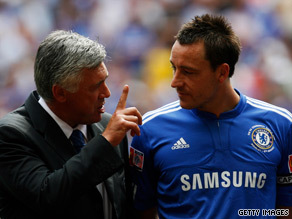 John Terry’s decision to stay at Chelsea will be key to Carlo Ancelotti’s chances of winning rhe title. Premier League stricken with debt?